Photo/laser therapy can be used as a single therapy or adjunctive therapy in combination with other manual therapies or electro-modalities such as acupuncture, ultrasound, and massage therapy. As scientists have understood more about the nature of light and its positive effects on the body, new techniques and devices have been developed to use light as part of the healing process. This is referred to as low level laser therapy or phototherapy. Phototherapy is an umbrella term that can include light from low level lasers as well as superluminous diodes, also known as light emitting diodes (LEDS). Low level lasers, also known as cold laser light, is compressed light, and is different from natural light in that it is one precise color. Lasers are coherent waves, synchronized, and monochromatic (a single wavelength). Therapeutic light energy can be produced by Low Level Laser Diodes (LLLD) and/or Superluminous Diodes (SLD). These diodes can be within the visible red to the near infrared and infrared electromagnetic spectrum. These properties allow laser light to penetrate the surface of the skin with no heating effect, no damage to the skin, and no known side effects. Specific wavelengths and power levels result in different levels of penetration and cellular effects. Low level laser therapy is the application of red and near infrared light over injuries or wounds to improve soft tissue healing and relieve both acute and chronic pain. Low level therapy uses cold (sub-thermal) laser light energy to direct bio-stimulative light energy to the body's cells without injuring or damaging them in any way. 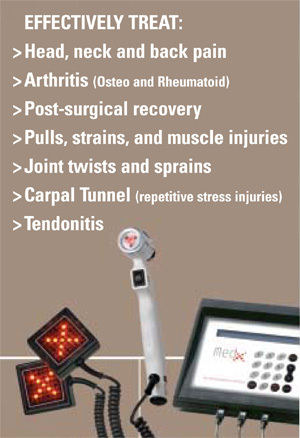 The therapy is precise and accurate, offering safe and effective treatment for a wide variety of conditions. The energy range of low level laser light lies between 1 and 500 mW (milliwatts), while the energy range for surgical lasers lies between 3,000 and 10,000 mW.